Does water used by the oil and gas industry deplete this scarce resource and thereby limit its use or drive up the price paid by farmers? How much oil-field wastewater is already being used by the agricultural sector, and what are the risks for livestock, human health, and food safety? Do we know enough about “legacy pollution” from orphaned oil wells that have contaminated soil and groundwater near farms? Why is information on the state’s oil and gas activities so limited, and how does that hinder proper risk management by farmers and ranchers? 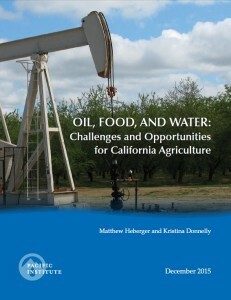 How can local, state, and federal policymakers and regulators make oil and gas exploration and production in California safer for the state’s food and agriculture activities? The in-depth study tackles these key issues along with many others and offers recommendations for addressing water-related risks to agriculture from continued oil and gas operations. “In California, government and industry can and should do a far better job of protecting public health, the environment, and the safety of food,” said Heberger.